Some people are active participants in life, they prefer to get into the thick of things and really experience everything. For others sometimes observing is more enjoyable than actually participating. These people are known as the wallflowers, but sometimes this can hold them back from certain things. 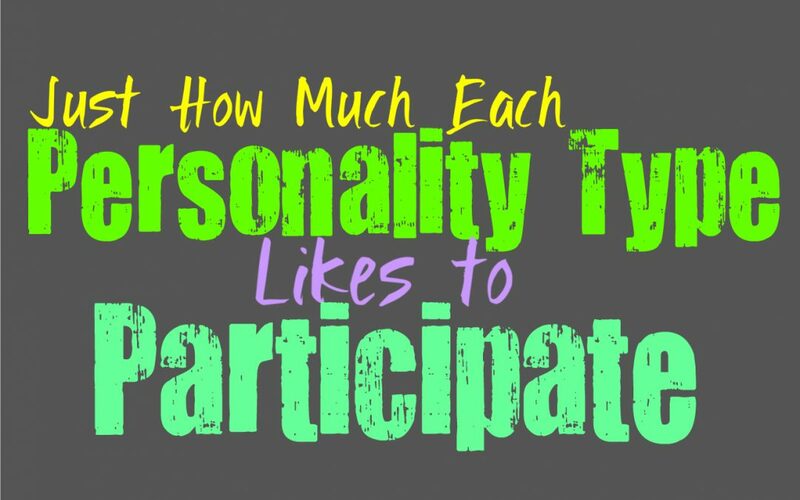 Here is how much you like to participate, based on your personality type. INFJs can sometimes avoid participating, especially if they are feeling too caught up in their own minds. Some INFJs find themselves wanting to observe much more than dive into, since they prefer to be more prepared for things. Sometimes their hesitation causes them to miss out on experiences, and stay within their comfort zones a bit too much. INFJs do however enjoy participating, they sometimes need someone who inspire this in them and really pull them away from their comforts and what they are so used to. ENFJs are definitely active participants in their lives, who enjoy really diving into things. They don’t like stepping out and just observing when they can actually experience something. ENFJs want to be able to learn from life and they don’t like being someone who stands outside of the scene. For them certain activities can be unnerving because they don’t like taking major risks, but they are very social and outgoing people. They often find themselves diving into something new simply because their loved ones inspire them to do so. INFPs can sometimes hold themselves back by being too caught up inside of their own minds. Sometimes they find themselves thinking about what they want and envisioning this so detailed that they don’t actually dive in and experience it. The INFPs imagination is so powerful and wonderful, that they don’t always participate in things simply because they don’t feel the need to. INFPs do like to experience life, but at the same time they sometimes pass up experiences for time to themselves inside of their own heads. ENFPs are often participants in life, who enjoy being able to really experience life. ENFPs don’t want to stand back and not actually dive into something just because they are afraid. They sometimes find themselves distracted by something new, but this is often a new experience. For the ENFP it is important to live their lives for real, instead of only using their imaginations. At the same time they do have vivid inner minds where they enjoy spending time thinking things through, they simply like a combination of thoughts and experiences in order to feel fulfilled. INTJs are definitely capable of participating in life, especially with things that require firsthand experiences. At the same time they prefer to be prepared and don’t want to participate until they are ready for what might happen. INTJs want to experience things on their own terms and believe in doing whatever they need to in order to learn and absorb information. They aren’t afraid of being an active participant, but at the same time they know when to take a step back and observe. ENTJs are definitely capable of participating in things, especially when they know they can learn from it. For the ENTJ life isn’t meant to just be observed, and at some point they need to dive in and experience things firsthand. They are definitely good at learning and being patient before diving in, especially since they value being prepared for anything and everything. When it comes down to needing to step in and participate, ENTJs are definitely brave enough to do this. While INTPs do want to participate in some things, they also have a side of themselves with is more of an observer. It often depends on the situation and what they are personally inspired to do. There are moments when the INTP feels stagnant and needs to just dive into something new and participate firsthand. There are other times when they just want to sit back and observe their surroundings in order to absorb and learn from what they see. ENTPs are definitely participants in life, and believe in a bit of hands on learning. For them it is rewarding to dive into something new and actually be able to get their hands on it. ENTPs do have vivid imaginations and rich inner minds, but they combine this with their natural curiosity and desire to push themselves. ENTPs want to challenge their own abilities and push themselves outside of their own comforts zones, instead of staying stuck in the same place. ISTJs are both participants and observers, and this entire depends on the circumstances. They are good at getting their hands dirty and aren’t afraid of stepping in when others are hesitant. ISTJs simply want to be prepared for their next step, and believe that they should take their time to learn before becoming a participant. This doesn’t actually hold the ISTJ back though, since they can learn quickly and prepare themselves for their next move. Once they are ready and prepared they will certainly dive in and participate in life. ESTJs are certainly participants in life and believe in diving in and getting their hands dirty. For the ESTJ it is definitely important to prepare themselves and learn as much as they can before diving in. They simply want to know that they are ready for something and believe in preparing their minds ahead of time, instead of being reckless and just taking chances. ESTJs do their best to get ready, but once they have strengthened their abilities they will certainly be ready to participate. ISFJs sometimes find themselves struggling to participate in certain things, simply because they can hesitate a bit. They have a hard time diving into experiences when they are afraid it feels a bit too risky. ISFJs are capable of getting their hands dirty when something requires their extra effort, but they can be a bit nervous to do so sometimes. ISFJs aren’t necessarily risk-takers, and sometimes they find their practicality holds them back from participating. ESFJs can be both active participants and a bit of the hesitant observer. There are times when they feel themselves held back simply because they want to observe their loved ones and figure out what they want. ESFJs care about tending to the needs of others and this often becomes their main priority. Their desire to protect those around them does sometimes hold the ESFJ back from actually participating themselves. They often have more courage to experience things when they feel less ties holding them back, but this rarely happens for them. ISTPs are active participants in life who enjoy actually diving in. They live in the present moment and want to actually enjoy life instead of just imagine it. For the ISTP it is important to actually participate in things to enjoy themselves and live life to the fullest. For them it often feels a bit draining to just sit back and watch life pass them by without being an active participant. ESTPs enjoy participating in life and sometimes this means taking action in a somewhat reckless manner. For ESTPs life is meant to be experienced to the fullest, instead of constantly hesitating. They would rather participate than simply observe, and so living vicariously through others just is not enough for them. ESTPs believe in diving in, sometimes headfirst and sometimes with a sense of reckless abandon that other people struggle to understand. ISFPs do enjoy experiencing life but sometimes they can be hesitant to dive in. They often need to have someone they trust to give them the courage to participate with things they would be insecure about. ISFPs want to be around people who bring out their more daring side, since it is a part of who they are it just becomes a bit dormant. When they are around the right people ISFP prefer to participate in life, they just want a partner to do so. ESFPs are active participants in life and they enjoy really being able to experience things firsthand. For the ESFP just sitting back and watching things happen, isn’t something they are happy about. When they feel stuck or incapable of living their lives, they feel stressed out and miserable. ESFPs are adventurous people who don’t like feeling like they are holding themselves back by not participating in everything they can.